How will I know if an organisation uses them? How do they fit into the recruitment process? What happens at a selection centre? Are candidates competing against one another? 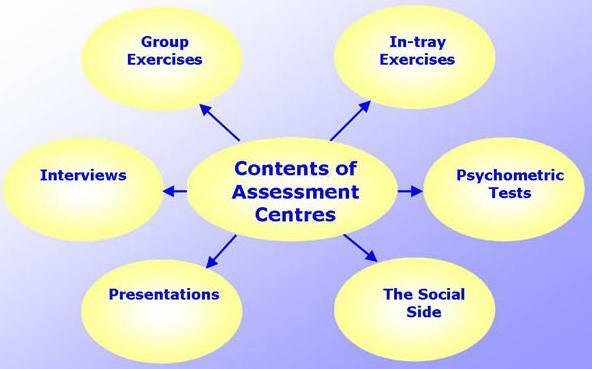 What does an assessment centre involve? Who makes the final decision on candidates? If I don't get through, will I be told why? Place the mouse cursor over any part of this diagram to get tips. Selection centres (also known as selection centres) consist of a number of exercises designed to assess the full range of skills and personal attributes required for the job. Large professional services firms, e.g. chartered accountants and law firms. The smaller the organisation, the less likely it is to use selection centres - they are very expensive to run! They are one of the most reliable methods of assessing candidates. Interviews, or any other method, taken alone, may be as low as 15% accurate. However, when scores from a number of different selection exercises are combined, their accuracy can rise to over 60%. They assess what candidates will actually do if selected: not just how good they are at interview! How will I know if an organisation I'm applying to uses assessment centres? Usually, the selection procedure will be outlined in the employer's brochure. You will never have a selection centre sprung upon you unexpectedly: at the very least, the letter inviting you will tell you what to expect. Large organisations may book a venue such as a hotel or training centre for the selection centre, which may last two days and and involve specialised staff such as psychologists, whereas smaller organisations may just run a day of exercises at their office. According to Personnel Today magazine assessment centres are most popular with service companies (e.g. retailers and banks), followed by public sector organisations with the lowest usage being by manufacturing companies. How do assessment centres fit into the recruitment process? With commercial employers, they are likely to be the final stage of selection. Usually, they follow on from an online application and a one-to-one first interview. Public sector employers may follow a different pattern - invitation to Civil Service Fast Stream assessment centres, for example, is dependent on reaching the required standard in the online reasoning tests and the supervised e-tray exercise, but no interviews are held before the assessment centre. Many are called, but few are chosen! Quite a small percentage of candidates gets to the selection centre: typically, five to ten per cent of the original applicants. So if you have got this far, you have already done well! What is being assessed at an assessment centre? The employer will have a checklist of competencies - the essential skills and personal attributes required for the job. Each exercise at an assessment centre will assess one or more of these competencies in order to build up a complete picture of each candidate's abilities in relation to the job applied for. Computerised methods such as psychometric tests are more objective and don't suffer from observer bias, but observational are much more effective for assessing personal attributes and personal competencies. Below is an assessment centre form based on a real example used by a retailer looking for trainee retail managers. PLACE THE MOUSE CURSOR OVER ANY UNDERLINED TEXT IN THE CHART BELOW TO GET TIPS. The secret of doing well at an assessment centre (or for that matter, an interview) is to try to enjoy it! It will be demanding, but will also be fun and the candidates who put the most in will get the most out of it. 75% is on how a candidate comes across rather than what they say. Presentation, firm hand shake, communication etc, are of key importance. Assessment centres usually last for one or two days. During this time a group of candidates - typically 6-8 people - will take part in a range of tasks, both individually and as a group, designed to assess the competencies that the employer requires. The group exercises (and some of the individual exercises, such as presentations) will be observed by assessors noting the skills and competencies displayed by candidates. At some centres, there will be one observer assigned to each candidate. Assessment centres usually take place at a hotel or at a company training centre. If an overnight stay is required, the employer will arrange accommodation and meals for candidates. The evening meal will usually involve the group of candidates and representatives of the company, both selectors and possibly recent graduates. You are not being formally assessed at this time, so don't worry - but at the same time, be sure not to drink too much and try and remember what your granny told you about table manners. No: everybody, or nobody, in a group might be successful. There are normally no quotas and everybody is performing against a standard. Managers from the company, who have been trained in assessment. There will probably be a mixture of managers from the HR/Graduate recruitment function and line managers for whom the eventual graduate recruits will be working. What is the most important part of an assessment centre? Candidates are assessed on their performance across all the exercises and there is no one most important part. If you feel that you have performed poorly on one exercise, you may well compensate for this by doing well in another. The interviews will be similar to the first in some respects: a conversation with one or two interviewers. You may be interviewed by more senior members of staff: senior personnel and/or specialist line managers. Points from your first interview may be probed in greater depth. are designed to test your numerical, verbal and/or spatial abilities and are timed so that you have to work quickly: it is quite normal not to have enough time to finish all the questions. Work through the tests systematically, do as many questions as you can and don't panic. See our Psychometric Tests page for more details and lots of practice tests. To access assessment exercises, visit our partner Graduates First. Graduates First provide assessment exercises, aptitude tests and other tools to job seekers, students and graduates. Kent students register using your Kent email address at www.graduatesfirst.com/cp/kent/login.aspx to get access to a portfolio of free tests and tools. You will be given a selection of letters, memos, reports etc, in either paper or electronic format, similar to that which somebody doing the job might find in their in-tray or email inbox first thing in the morning. You will have to read through each item, decide on the action to be taken and the priority to be allocated to it and possibly to complete certain related tasks such as summarising a report or drafting a reply to an email. This exercise tests skills related to the job in question, particularly analytical and decision-making skills. Again, time constraints will be tight. We were given 30 minutes to build a free standing tower with 50 sheets of A4 paper, 3 rulers, 50 paper clips. You had to make it as pleasing and as cheaply as possible: each object used was given a cost. We were given a group exercise where we had to discuss the merits of different media (optical fibre, microwave, radio, submarine cable - don't worry, all the necessary information was given to us beforehand) to build a communications network between a set of small islands. I know less technical info than the other candidates, but the idea was to ask for other's opinions and make suggestions. Most importantly, don't hog the conversation: listen to the views of the other candidates. In the written tests and interviews, they were looking for the ability to look at all sides of an argument objectively: student applying to Civil Service Fast Stream. Debate a work-related problem and come to a joint decision. Complete a task, e.g. constructing a puzzle. In most cases, you will not be competing against other members of the group: the entire group may be selected or rejected. The assessors will be looking to see how individuals function as members of the group, and how they respond and react to one another. Think about the skills and personal qualities that will be required in the job. For some types of work, the assessors may be looking for very assertive and dominant people: in most areas it's likely that teamwork, co-operation and the ability to listen to others will be important. Teamworking Skills page includes a comprehensive set of tips on how to perform well in group exercises. Keep within the allotted time. See our Presentation Skills page for lots more tips. At the end of the assessment centre, all the assessors will discuss all aspects of the candidates' performance. The observers will rate candidates and give the evidence upon which their ratings are based; this is then likely to be discussed by the group as a whole before a final decision is reached. Usually, yes - the assessment centre is the last stage in the selection process and will be followed by a job offer or rejection. If there are any problems - perhaps you have been offered a job with one employer while still waiting to hear from another - then ask to see a careers adviser. Most employers are happy to provide feedback on candidates' performance at selection centres, if the candidate requests it - so don't hesitate to ask. Second Interviews These may be more in-depth than a first interview. Example Selection Centres See the timetables for two typical selection centres. Case study The type you might get at an assessment centre. Business game example of the type used at assessment centres. Balloon debate again type you might get at an assessment centre. Teamworking skills Interactive exercise and tips for group work exercises in assessment centres.